Hey everyone! It’s been quite a while (just over 3.5 months). Life has finally settled and I have lots of projects and news to share with you. Since it’s been such a long time, I’ve compiled a list of popular FAQs to get you all up to speed. Getting the house ready to be on the market was a much bigger job that we anticipated. We kept thinking “This is the last big week” but then the weekend rolled around and our list was still filled with things like mulch the front yard, clean the basement, fix that pesky molding, patch that hole caused by 1970s phone cord. Ugh. But it’s done now! We put the house on the market on July 12th! When I got home from work that night I took a pic of the lawn sign because I could hardly believe it. All those months of hard work were done, done, done. We’d been looking for a place in center city – one with enough outside space to enjoy and walking proximity to restaurants and shops. We just couldn’t find it in center city so we broadened our search. We found outside space but lost the proximity. We started to get nervous about selling our current house (which we love in a lot of ways) and getting stuck buying something in the city that didn’t quite work for us. But we figured in this market we’d have a few months to think about it and decide. And then we got a call on August 1st with an offer – a good offer – and we had to think fast. We decided to take the house off the market and do a few of the larger renovations we’d considered doing to make the house better fit our lifestyle. We get to enjoy all our hard work and for the first time ever we’re living in a house with no projects. It’s awesome! During the time we had the house on the market I was contacted by a center city firm. They found my profile on LinkedIn and thought I’d be a great fit. Several phone and in-person interviews later and I decided to join their team! I start this Tuesday and I’m very, very excited. I’ll be joining a great company, I’ll be in the city 5 days a week, and for the first time ever I’ll have a train commute. 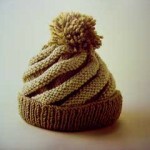 Can you cay commuter knitting? BTW, feel free to connect with me on LinkedIn. You never know where a connection might lead. Just let me know you’re a blog reader when you send the connection request. I started a Colourflow Wrap in several shades of Koigu KPPPM. I bought a lot of Koigu early on in my sock knitting but discovered it’s a bit too thick for socks for my taste. I’ve been holding on to them because I have mostly 2 skeins each but I decided to bite the bullet and do something – anything – with this beautiful yarn. 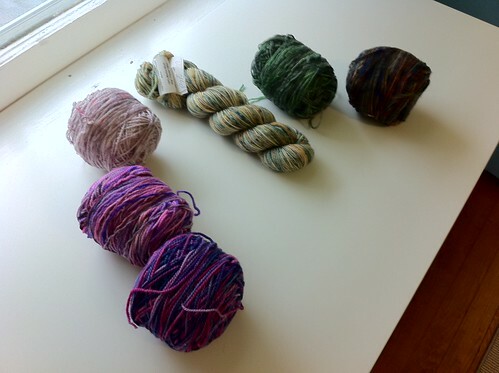 The pic shows 6 skeins. 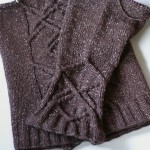 The pattern uses 9 skeins but I’m starting with 6 and I’ll pick up a few more skeins if I really need a wider wrap. I’m more of a scarf girl so 6 might be perfect. I also started sewing again! The new job is business casual and I haven’t been in a business casual office for close to 15 years. I started by making a test version of Simplicity 2475 and I’m almost done with the modifications to make it fit perfectly. The Simplicity Amazing Fit line is fabulous! One-inch seam allowances where you need them for a custom fit and lovely details – this skirt has 2 kick pleats in the back! I plan to make several of them including a black skirt with red kick pleats. I also started a sock. It’s been several months since I’ve done any sock knitting – any knitting at all – and I needed a portable project for my commute. I’m doing Bubble Stream in Regia Color 4 ply in red. I’m double dipping in 2 KALs this month – SKA September and Solid Socks September. It sure is nice to be back. But enough about me. How are you all doing? I’m woefully behind on my blog reading. How have your summers been? Plans for any fall knitting? Who’s going to Rhinebeck? Alright Alright I’ll Tell You! My summer has been pretty busy, with managing my family’s multiple appointments to enrolling in an e-course to help grow my knitware design business, to contacting a graphic designer about branding. It’s been totally fun, and completely overwhelming.